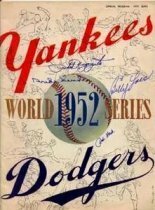 The 1952 World Series featured the three-time defending champion New York Yankees beating the Brooklyn Dodgers in seven games. The Yankees won their fourth straight title—tying the mark they set between 1936 and 1939 under manager Joe McCarthy, and Casey Stengel became the second manager in Major League history with four (4) consecutive championships. It was the fifteenth championship in the Yankees' history, and the third defeat of the Dodgers in six years. In Game 7, the Yankees' second baseman Billy Martin made a game-saving catch. Also, the home run hit by Mickey Mantle during the eighth inning of Game 6 was significant because it was the first of his record eighteen (18) career World Series home runs. In what was now becoming expected, the New York Yankees returned for their eighteenth World Series appearance against their cross-town rivals, the Brooklyn Dodgers. The Bronx Bombers had finished off the Giants "Cinderella" season the year before and were determined to retain their title as the kings of the "Big Apple" baseball teams. Charlie Dressen's Dodgers were angered by the heavy favoritism that the Yankees received in the press and many fans had already crowned them as champions before the first pitch was even thrown. Their frustration was merited and inspired them to a 4-2 victory that featured a six-hit effort by Joe Black who was coming off a 15-4 season in which he made fifty-six appearances (the first fifty-four coming in relief). Jackie Robinson, Duke Snider and Pee Wee Reese all supported the rookie's debut effort with home runs of their own. Perhaps now the press would give the National Leaguers some respect as Game 1 represented more than just an opening win. The Dodgers had made a statement and the Yankees were taking notice. Billy Martin was the standout in Game 2 and put the Dodgers back in their place with a three-run blast and a RBI single that backed up Vic Raschi's 7-1 performance. Not to be outdone, the Dodgers came back swinging and answered the Yankees challenge with a strong outing by Preacher Roe, who held the "Pinstripes" to a 5-3 loss. Once again, it was anybody's Series and pitching seemed to be the only deciding factor. Allie Reynolds continued to tip the scales back and forth with a dominant 2-0 triumph in Game 4 that balanced the Series at two games apiece, but Carl Erskine answered back with a 6-5 win in the eleven-inning, Game 5. The Dodger ace allowed only four-hits and all five runs in the fifth inning, but permitted only one other hit which was a bunt-single by Mickey Mantle in the fourth. Duke Snider, who wound up with four homers and eight runs batted in during the Series, hit a two-run homer in the fifth to counter a three-run blast from Johnny Mize in the Yankees' half of the inning. The stalemate continued the following day when New York's Vic Raschi and Brooklyn's Billy Loes held each other scoreless for 5½ innings. Loes got the upper hand however, when Snider knocked a Raschi pitch into the rightfield bleachers to lead off their sixth. Unfortunately for the Dodger faithful, the 1-0 lead vanished immediately in the top of the seventh when Yogi Berra led off with a one-run blast igniting a Yanks rally. Raschi knocked in the second run by singling off his adversary's knee and Mickey Mantle kept the momentum alive in the eighth with a homer of his own (the first of many). Raschi, working on a 3-1 lead, retired the first Dodger in the bottom of the inning, but the irrepressible Snider followed with yet another home run. After George Shuba doubled with two out, Allie Reynolds came in as relief. 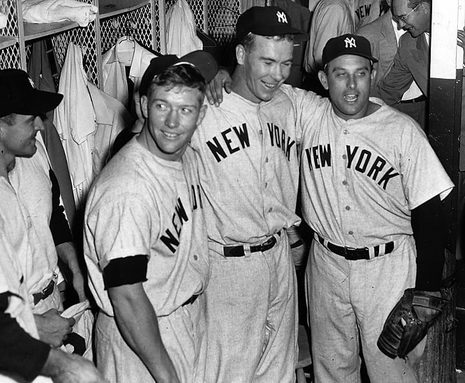 Reynolds, the Yankees' big winner in 1952 with twenty victories, struck out Roy Campanella to end the inning and, outside of allowing a walk to Carl Furillo, held the Dodgers to no runs in the ninth. With the Game 6, Series-tying 3-2 triumph, the Yankees were once again ready to try and finish the job and add yet another World Championship to their mantle. In an unusual, but indisputable move Casey Stengel started Eddie Lopat against Game 1 winner and Game 4 loser, Joe Black. The veteran, bothered by shoulder problems, had won only ten games for the Yanks in '52 (after going 21-9 in '51), but it mattered little as the Yankees tied it in the fifth courtesy of a Gene Woodling homer and added an insurance homer by Mantle in the seventh. Brooklyn almost took the lead that same inning after loading the bases when Furillo reached first on balls, Billy Cox singled and Pee Wee Reese walked as well. Anticipating a disaster, Bob Kuzava was summoned from the bullpen. The lefthander came up huge and got Snider to fly out to third bringing up Jackie Robinson. With the count at 3-2, Robinson snapped a textbook pop-up towards the mound. Kuzava seemed confused on the location and Joe Collins, the man in position to make the play, lost sight of the ball. All the while, Dodger runners were tearing up the baselines with two crossing the plate and another rounding third. Billy Martin, who was caught in the middle at second quickly sized up the situation and made a miracle catch inches from the ground. The phenomenal grab not only ended the chances of a Dodger comeback, but also inevitably sealed the Series victory for the defending champions. Despite their best efforts, "the Bums from Brooklyn" lived up to their nickname, as Kuzava remained in control the rest of the way. The loss was especially devastating after winning Games 1, 3 and 5 and the 4-2 triumph enabled Stengel to match Joe McCarthy's mark of managing a club to four consecutive World Series titles.